Some of us just like making things, though. I had wooden blocks as a little kid, and Lego bricks galore after that. One thing that stands out in my memory, though, was making WhiteWings airplanes with my dad. We made all kinds of things with Legos, too, of course (never a camera, but that’s been done). But the WhiteWings stick in my mind. And Transformers. I remember it took Dad about an hour to apply all the tiny decals when I got a Jetfire action figure. As a young teenager, I graduated to doing my own decals on plastic model airplane kits, and eventually to assembling and painting my own Warhammer 40,000 figurines. So it’s only natural that I’d look into building cameras. Pretty much the pinnacle of DIY camera kits, in terms of features, is the Konstructor from Lomography. While it uses a waist-level viewfinder instead of including a pentaprism, it’s pretty much a (plastic) SLR camera you can buy in pieces and put together yourself. The Verge spoke very highly of the Konstructor when it was released, and the price tag is very reasonable for what you get. There are even close-up and macro lens attachments available, and a magnifying chimney for the viewfinder. $35 (additional cost for some accessories). 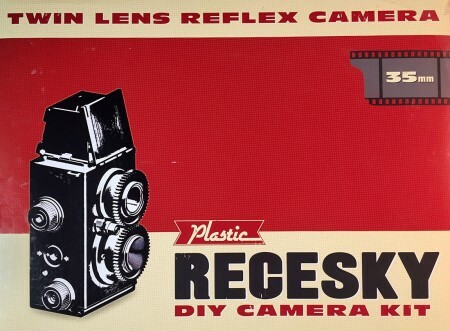 The Recesky DIY Camera Kit is is a tiny TLR camera that uses 35mm film and has its two lenses coupled with gear teeth around their outer edges. It looks for all the world just like a once-popular PhotoJojo TLR kit that seems to have been discontinued. Fotodiox’s TLR kit looks like the same one, too. The pieces come neatly laid out in a styrofoam tray and it goes together easily with snaps and screws. The instructions caution you to use the included screwdriver in order to avoid any over-tightening. Mine did not include a screwdriver, however, so I used a regular precision screwdriver and had no trouble at all. $20. Available in four colors, The Pop-Up Pinhole Co.’s VIDDY is printed on heavy card stock from which you’ll punch out the pieces before assembling them with stickers and pins, and just a drop or two of glue. 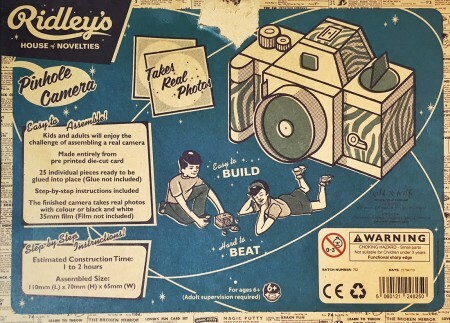 The end result is a pinhole camera that you can customize a lot with the included stickers or by coloring the raw cardboard yourself before assembly. $27. The VIDDY’s big brother, the VIDERE, looks more like a TLR and includes a handy viewing lens for the viewfinder. It appears to be larger, but it’s still made out of printed raw cardboard. The VIDERE is glued together, though. $27. Looking surprisingly like any of a thousand cheap promotional cameras in thrift store bins, the SuperHeadz “Last Analog Camera” kit is simple but complete. It’s also sold under the Powershovel name, and includes two interchangeable lenses and an alternate back designed to produce light leaks (or would that be more light leaks?). The finished product even has a thumbwheel for film advance, and a rewind knob with a flip-out crank. $50. 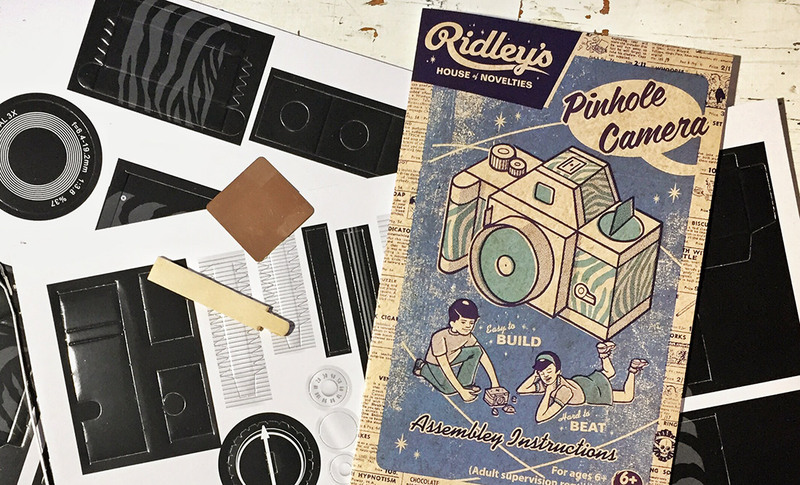 The Ridley’s DIY pinhole camera appears to have been discontinued, but I had a lot of fun building the one I found at a thrift store, so it might be worth looking for. A lot of toy companies still list them for sale, and they appear to show up on eBay all the time. The name on mine was “Ridley’s House of Novelty,” although it appears some were sold under the name “Ridley’s Kaleidoscope.” It’s just printed cardstock you punch out and glue together, but the finished product is impressively decent-looking. I haven’t tried mine out just yet… $10 and up. Their website looks half finished, but it appears Bulldog Self Assembly Large Format Camera kits are available from a number of major online photography sellers. This one looks a lot more involved, utilizing wood and screws, and requiring drilling and other more advanced handyman-type skills. But the finished product includes a pinhole lens board, and will accept standard large format lenses in a Linhof-style lens board. Available in both 4×5 or 8×10 sizes. $200 and up. Very similar to the Ridley’s Pinhole above, the Hole-on EX Make-And-Shoot DIY Pinhole Loonar Goupe Camera Kit, aside from its fantastically long and confusing name, is made from cardstock you punch out, fold and glue together. The manufacturer recommends it for ages 12 and up, or younger with supervision. Since everything is die-cut from the factory, there’s no debate about whether the constructee is stuck with the blunt safety scissors or gets to use the big people scissors from the kitchen drawer (which they think are aces but we think of as infuriatingly dull). $20. Straight from UltraFine Online: “The Superheadz Plamodel 35mm Camera Kit is a snap-together kit which also has been copied and sometimes is seen as the the ‘Camman DIY 35mm Camera.’ These kits are basically a version of an unassembled Vivitar IC 100.” The IKEA flatpack of cameras, it uses a mixture of glue and screws and even includes a screwdriver right in the box. What makes this guy unique is its wide 28mm lens. While the original is available in a choice of black or black, there is also the Powershovel MORIYAMI edition with fancy graphics on the front. $20. Not just a pinhole, not just a point and shoot — this kit includes both a lens and a pinhole board. It also comes with a 68-page educational booklet that marries instructions and basic use guidelines with photographic history and technique instruction. The Lens x Pinhole Experiment Camera also has a screen that can be used to view the image projected by the lens in place of using film, so it’s a real educational opportunity if you’re hoping to help a kid get into photography (please, do this). $25. The Sharan Wide-35 makes big 2.25×1-inch panoramic negatives and even includes a tripod socket. Made from simple, flat black cardboard with a fancy clamshell design, it’s designed to be assembled quickly with tape. 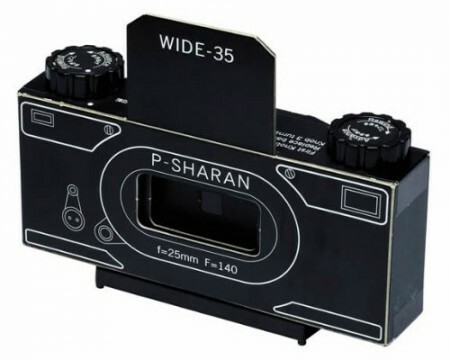 Sharan also offers the standard-frame STD35m, and a 24×24 millimeter square format pinhole — the SQ-35. There’s a knockoff version of the square-frame kit that’s just $9 on Amazon. $25-90. Sold under the Recesky and Gakken brands, this stereoscopic 35mm pinhole camera kit may or may not be currently available. Alibaba appears to ready to sell them as long as you’re willing to buy ten or more. The selling point here is that the camera makes two frames simultaneously, from two different perspectives. Combined properly, the two will form a stereoscopic image that approximates three-dimensional reality. You can scan the film and use software to animate the two images to alternate, or mount prints side-by-side and view them with a stereoscope. $25. Okay, technically not a camera yet. It’s actually just a black plastic 1-gallon paint can you can punch a hole in to make a classic paint can pinhole camera. Also available in 1-quart size. If the part of DIY where you actually do stuff yourself seems burdensome, you can also spend a little more for this pre-drilled paint can ($20), avoiding literally the only step in the process. $2-5. This starts life as a camera already, but you make it not a camera any more. I had to include it on this list because it’s just so brilliant. I’ve mentioned it before because I love the vintage chic. TL;DR: Make an old (preferably irreparably-broken) film camera into a night light hipsters will pee their skinny jeans over. $5-500. Another non-functional offering, the Impossible Project’s Polaroid Classic DIY Paper Camera Kit is a set of 6 different miniature paper cameras you can assemble, and a “set of mini faux Polaroid images that develop under moderate heat.” $20. There are a few other options out there — pump “DIY pinhole” into Amazon or Google and you’ll find lots of paper camera options which I haven’t listed because they are so similar to others. And if you want to go beyond assembling cameras from kits, you can try this pattern for a laser-cut acrylic camera, or 3D print one like the terraPin 2HT stereo pinhole camera. You can even make delicious gingerbread cameras. However you do it, building your own cameras or accessories is a rewarding experience, even if most of the kit cameras produce results that would make a Holga thumb its lens in contempt. Did I miss one? Have something to add about any of the kits here? Let me know in the comments below!